There’s No “I” in TEAM | ARES, Inc. Agents constantly call and ask me about teams – developing them, joining one, selling one, and many questions in between. 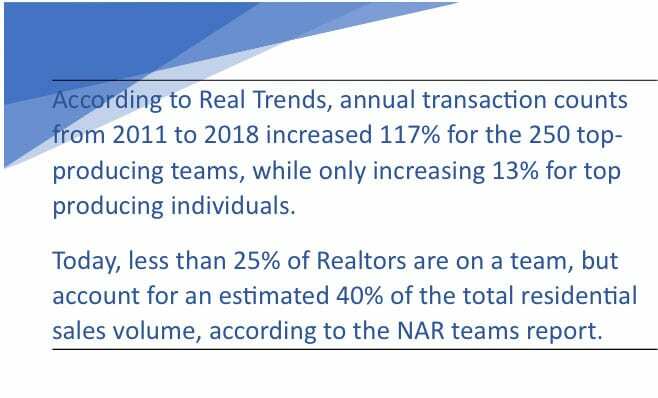 Throughout real estate history, there have been times when teams have been trendy and times when they’ve been necessary. We’re in a time of necessity and I only see the need growing. Why? Simply because the cost of competing is no longer palatable. Let’s address the obvious first, that no one human being is good at everything. Managing the day-to-day challenges of being a real estate sales professional is time-consuming and humbling alone. Now add technology & automation, transaction process & customer service, marketing – in all its forms – including digital, and now add the speed at which apps, software programs, CRMs and workflow automation is changing, then top it off with industry interrupters, continuing education requirement changes, and training on the tools. Small business owners in general, especially Realtors, are overwhelmed. Where’s that showing up? In their pockets and bank accounts. No one brokerage can create a current-day to end-of-career tech platform that will meet the needs of all their agents doing business around the world, despite experience level. They just can’t. So, if an agent can’t survive alone, and the brokerage isn’t a one-stop-shop for all their needs – the solution is the TEAM: A smaller group offering specific tools that apply to top-producing, like-minded agents.